Current supply chains function on a foundation of invisible and often contested power held by those who have access and/or rights over land and its resources. As raw materials flow from origin to market along complex routes this power is often imposed and not without consequences. Strata Stratum Stratus seeks to reveal the power structures in relation to one material, in one place at a moment in time. By remaining in-situ, to be bought but never truly possessed, this sandstone work draws into focus layers of significance that are too-often ignored or overlooked, returning agency to the place, the rock, existing value systems and our presence in the landscape. "...this exhibition includes works that demand control. These designers set themselves limitations that instrumentalise their works as critical responses to burgeoning supply chain problems. Elliat Rich and James B. Young argue all claims for the rights to extract, process and ship mineral resources are suspect at the intersection of sovereignty and sustainability. 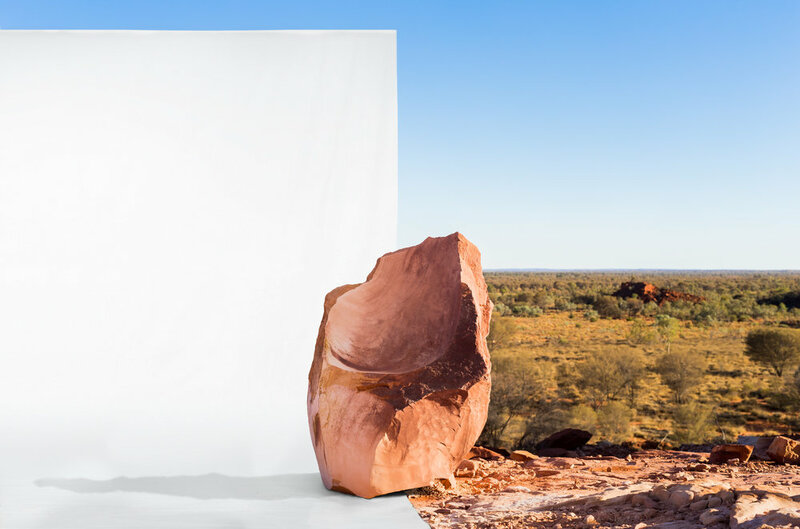 The chair they carved from sandstone in Alice Springs – sandstone formed under Australia’s prehistoric inland sea – is transported only virtually, reconstructed via augmented reality technology in the gallery. Clearly the environmental aspects of transporting such a heavy work are significant, but the work also raises transcultural issues. Should we only be concerned with the energy and material costs of supply chains, or are there cultural costs? This question is in the context of a chair made from a rock on a mining leasehold, with uncertain legal arrangements for future access, within the unceded territory of the Arrernte nations."